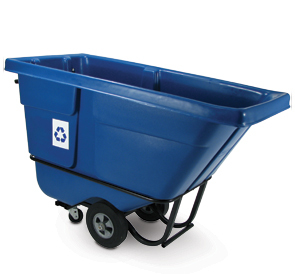 This Recycling Tilt Truck features industrial strength construction to transport heavy loads with ease. Improve your facility's recycling program by implementing efficient, cost-effective waste sortation with mobile collection equipment that's built to last. All plastic is corrosion resistant and has a low risk of scratching floors or snapping carpets. Post Consumer Resin (PCR), meet or exceed EPA recommendations for PCR content, and count toward LEED® credit and government procurement requirements.